It's been a super crazy couple of weeks in my neck of the woods. I feel like I've hardly sat at my sewing machine, save for a few stolen moments earlier this week when I whipped up the July block for the Lucky Stars Block of the Month Club. For those of you who hoped for an easier star after two really challenging ones, you're getting your wish! This month's star is a simple eight-template star, so we're going to take it easy this month! I'm missing sewing terribly, but unfortunately, I don't see things changing too much for at a few more weeks. After a frenzied, stressful week and a half of house hunting, we've found ourselves a wonderful new house and are now in the oh-so-enjoyable process of moving. I've been a purging machine this week, lining up bag after bag to donate to Goodwill and even more bags for the garbage man! It's sad to think of packing up my sewing room, but I'm really excited about our new house, so I'm hoping that excitement will carry me through the move. So, if you don't hear much from me over the next few weeks, know that I'm purging and packing and wishing I was sewing! The new house also has a bonus feature: a deer family that lives nearby! Happy Monday to you all! I hope you had a great weekend :) I spent most of my weekend teaching at my local quilt shop, which was a great deal of fun, and also teaching my munchkin how to do some various chores around the house. He's got a knack for dusting already! Lucky #204 (even though this photo only shows the #4, she's truly #204.) Melanie!! Congratulations! I'll be emailing you momentarily to get your address information. And there's two more quilts that are headed to the show floor, so keep your eyes peeled for them, if you're headed to Austin in a few weeks. Have a wonderful Monday! On this last Monday of 2012, I find myself wondering where the year went! Admittedly, it was a busy year full of lots of exciting things, many of which I still can't share, but I have to say, as awesome as 2012 was, I think 2013 is shaping up to be even more exciting. I'm awfully proud of the quilts I've made this year. If you asked me to pick a favorite, I don't think I could! I was lucky enough to see my work in print again this year, which was wonderful, and I loved seeing photos of my quilts hanging at Fall Quilt Market. I'm also really proud of the patterns and tutorials I've written this year, and the Lucky Stars Block of the Month Club I'm starting for 2013. I cannot get over how many people are participating in the Lucky Stars BOM, and it seems to continue growing every day! This BOM is definitely going to make my 2013 very starry and bright. Teaching was another really bright spot of my year. I'm finding that I really enjoy getting to work hands on with my students, and am looking forward to a lot more teaching in 2013. I loved teaching at Sewing Summit, and teaching in my local quilt shop back home has also been a great experience. The girls there are so welcoming and nice, and my students have been such a joy to work with. Happy New Year to you and your family. Thank you for all of the kind and wonderful comments you leave here on my blog, I really appreciate each and every one. And because I appreciate you, my wonderful followers, so much, I'm giving away a Happy New Year gift - a fat quarter bundle of Bonnie & Camille's Vintage Modern collection. 42 glorious, beautiful fat quarters, just for you! As this giveaway is a thank you to my followers, you must be a follower to enter. Simply leave me a comment here telling me about your brightest memory of 2012, and I'll pick a winner on Thursday, January 3rd. THIS GIVEAWAY IS NOW CLOSED. It's really true what they say - it's the most wonderful time of the year! We've had a little cold snap move in here in Florida, and it's making feel even more like the holiday season today :) Here is a sneak peek of the practice block for the Lucky Stars Block of the Month club, going out to all club members on December 26th. Happy holidays to you and your family :) I hope you're having lots of fun this holiday weekend! It's only a few days before Thanksgiving, and I feel like I'm already running around like a chicken with its head cut off. I feel scatter-brained, to say the least, even though I've got lists coming out my ears. Lists of cleaning to do before our guests arrive on Thursday, lists of Christmas presents that I've bought and where I've hidden them (as I'm known to completely lose gifts altogether once they're hidden), a list of last minute grocery items I know I will need to pick up tomorrow to ensure freshness, a list of my sewing projects so that when I have a moment or two of free time I can at least think about sewing), and so forth. My class on free motion quilting last week at Inspire went really, really well. I had a lot of fun with it, and I think my students did too! We talked about four different beginning styles of FMQ and did a lot of practicing. It felt really great to get to meet other quilters and to share my knowledge. I'm definitely looking forward to teaching again soon at Inspire. When I got home from class, I got right to work on my last bee block of the year for Lee, with filled with scrumptious solids. Her quilt is going to be so gorgeous once she gets all of our blocks together, I can't wait to see it put together! It's been a long couple of days in my neck of the woods. If you don't follow on me Instagram, you probably don't know that last Thursday, I had to cart my family to the ER, as my husband was convinced he had appendicitis. He was in horrible pain, to the point where he could barely move. It was scary, but I tried to put on my game face, so my four-and-a-half year old wouldn't feel as scared as I did inside. Once he got to a room in the ER and the nurses and doctor started taking a look at him, it was evident that they thought he had a kidney stone. After some tests, the diagnosis was confirmed, and he was sent home with some prescriptions to make him more comfortable while he waited at home for the stone to pass. Five days later, still no progress. He's still in pain off and on, but I'm crossing my fingers that before Thursday morning he'll have that moment and feel much better. Over the weekend, we went to our last soccer game of the season for the kiddo. They won their game and had a great time, and even got trophies afterward. He really enjoyed his first season of soccer, and I loved cheering him on. I have a feeling we'll be doing more soccer next year. He's home from school all week for Thanksgiving break, and so far, I've managed to not break my neck while navigating the living room floor, constantly covered in Legos. Knock on wood! I volunteered to make something for the upcoming holiday silent auction at the kiddo's school - just some simple zipper pouches. I think I'm aiming to make a set of three, in varying sizes. I've pulled some fabrics that I think might be fun to use together and that would be appealing to the families at school. Next, I need to find some fabrics to use for the linings. My darned laptop (which is barely eight months old) is giving me some serious troubles, so I'm going to be going off the grid for a few days, attempting to resuscitate it with some Recovery disks and lots of patience. Hopefully, I can get rid of the zillion and twelve errors that are popping up in my Event Viewer and nip my blue screens of death in the bud. It's been a rough couple of days here in the Not Betsy household, between coming down with a monster of a cold and finding out that our six-year-old air conditioning unit needs to be replaced. So, I did what I always do in tough times...bake. Yes, I love to sew, it's my most favorite thing in the world to do right now, but baking was my first love. I've been baking since I was a little girl, under the tutelage of my mother, who learned from her mother, and so on. In our family, baked goods have always been something special; never something that came from a box, always something that was made from scratch. I can remember when I learned that the way we baked in our family was not exactly the norm; my best friend's mother suggested that we make brownies during a sleepover when I was 8, and she pulled out a red box of Betty Crocker brownie mix from the pantry. That was probably the moment I turned into a baking snob. I'm kidding...mostly ;) I'm just the kind of dork who enjoys baking from scratch. 1. Preheat oven to 375 degrees. Prepare two standard sized 12-cup muffin trays either with Pam or muffin liners. 2. Add sugar, oil, milk, and vinegar to one large bowl and whisk until well combined. In a separate bowl, mix dry ingredients and lemon zest with a fork. 3. Dump your dry ingredients into the wet ingredients and mix gently. 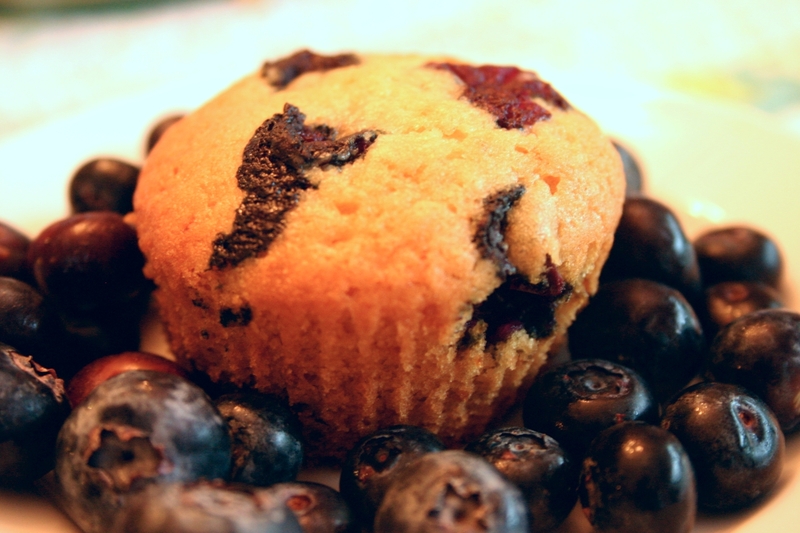 Don't overmix - you'll create tough muffins. A few streaks of flour are okay here. 4. Add your blueberries and fold gently into the batter, again being careful not to overmix. 5. Fill muffin liners/cups approximately halfway full and bake in your preheated oven for 20-22 minutes. Allow muffins to sit in tray for five minutes after they come out of the oven, then transfer to a cooling rack to finish cooling, although these muffins taste fantastic when they're warm! They also freeze well. Happy Friday to you all, I hope you have a great weekend! Let me back up and tell you what happened. Yesterday morning, after I dropped off my kiddo at preschool, I was all set to start quilting my secret quilt, and I thought to myself, oh I should clean out my machine before I get started. I diligently took apart my bobbin casing to clean out the machine, using this little eyeshadow brush I've used over the last year. Yes, it's a makeup brush. I used it because it fit into all the nooks and crannies nicely, and it worked wonderfully...until yesterday. The brush broke in half, and the top half of the brush fell into the black abyss inside my machine. I dug out my tweezers and tried to pry it out, to no avail. I busted out my vacuum and tried to vacuum it up, with no luck. Next, I took my machine to my sewing machine dealer, and spent over 30 minutes with their special teeny tiny tweezers, and still couldn't grab the brush, no matter how hard I tried. They told me I could leave the machine for the repairman, but that he would charge me $80 to open up the machine. My husband had a conniption and swore he could fix it. And fix it, he did. It may have taken a tense 45 minutes, in which I paced and cursed myself for causing all this trouble in the first place, but my husband saved the day and pried that evil thing out of my machine. The moral of the story? Never clean a sewing machine with a makeup brush. From now on, I will strictly use the vacuum to clean out my machine. Now on with the sewing! Once again, it's quarantine time at my house. All three of us are sick today, with this dreadful cold that we have been passing back and forth, seemingly, for the last two weeks. Today, we're all feeling pretty rotten, especially the munchkin. Is there an expiration date on disinfectant or something??? I swear, I've been disinfecting left and right, and yet, this cold is still kicking all of our butts. Argh. It's Friday morning, my munchkin's at school, and I am rocking out this morning. I need good music to get my Mommy chores done...otherwise I lose focus. I'd much rather be sewing, but the amount of dust I noticed last night on my coffee table tells me that I've been a bit neglectful of the house lately, so my house is filled with the sounds of Adele and Gavin DeGraw this morning. Somehow, while singing along to my favorite music, I can bust out some serious cleaning, so that's what I am up to this Friday morning...so I can sew all weekend long! OK, so it's no secret that I like to quilt. A lot. 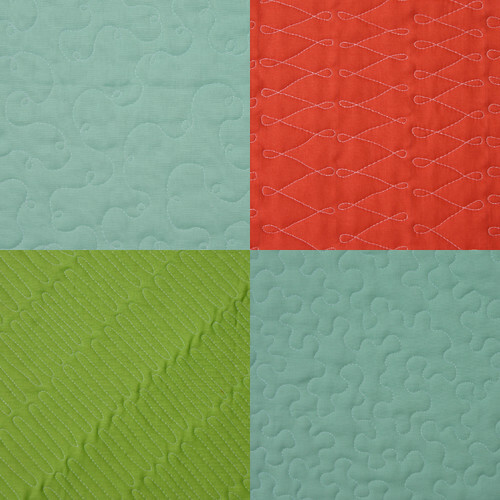 I spend a lot of time thinking in quilts, daydreaming about color combinations and block designs. Apparently, it's starting to rub off. On my husband. At dinner last night, whilst waiting for the munchkin to finish his meal (which inevitably takes twice as long as us grown-ups), he grabbed a napkin and one of my pens and started to sketch his own little quilt. Have you visited the Blogger's Quilt Festival yet? I've found a ton of new blogs to follow and found a great deal of inspiration as well! I shipped out Brooke's Paramore quilt this morning, all quilted up and ready to be bound and finished off. It was a lot of fun to work on someone else's quilt, and I'm really pleased with how it turned out. I hope she'll love it, too! Did you hear? I won an awesome giveaway over at Freshly Pieced last week! Lee a.k.a. Freshly Pieced, is designing a custom blog header for me. I'm working with Lee today on it today and hoping to unveil my new and improved blog look sometime this week. I am super excited about this and can't wait to show you all soon! Getting ready for a big family fun trip this afternoon - to a Yo Gabba Gabba concert. My munchkin adores Yo Gabba Gabba, and is positively going to flip out when we tell him where we're going this afternoon. I am, embarrassingly, excited about this show/concert/thing, if nothing but to see the look on Ryan's face when he sees these characters that he adores in person. And because it's just not normal for me to have a million projects going at once, I'm planning to get started on my quilt for the That Girl...That Quilt quilt-along that's just getting underway. If you've got a charm pack lying about, come join in the quilt along fun!! Hope you're all having a great weekend. Happy sewing!